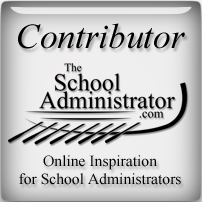 As you know, I’m on this journey toward School Administration Mastery. On this journey, I run across many new ideas that I want to make sure I remember, so I can implement them when I need to. Recently, I was asked to review a new teacher evaluation walk-through form that my Principal and Assistant Principal developed to help them as they visit classrooms. As I was looking over this walk-through form, I found that it focused on looking for four main observable areas of evaluation: Rigor, Instruction, Engagement and Connections. The last one, Connections, was new to me. In all my years of being a teacher, I have always been asked to set goals in the other three areas, but never had I been asked to demonstrate my ability to connect with my students. I was always good at connecting with my students, but it was because I wanted to, not because it was going to be part of my evaluation as a teacher. When I saw that Connections was going to be used to evaluate teachers at my school, I was impressed. Any successful teacher will tell you that being able to have a positive relationship with your students is one of the most important pieces to having a successful class. I learned as a teacher, that many of my challenging students behaved better for me than with other teachers. They did more work for me than they did for other teachers, and it all came down to the fact that we had created a positive connection. In my experience as a school administrator, I can honestly say that the teachers who are the most successful do not only demonstrate excellence in rigor, instruction and engagement, but also make those positive connections with their students. I believe that excellence in rigor, instruction and engagement is made easier when there is excellence in making positive connections with students. I know that we are in a political environment where schools are being asked to demonstrate higher test scores and lower failing rates. For this reason, we ask our teachers to focus more on rigor, instruction and engagement. That is why I was so proud of my Administration when they decided to add Student Connections as a fourth area of focus. They saw the importance of building and maintaining these positive relationships with students. Hopefully teachers will find this an easy area in which to demonstrate excellence, but for those teachers who struggle in this area, perhaps making it part of their evaluation will encourage them to pay more attention to this area of weakness. Imagine if every teacher was evaluated as Advanced in all four areas? I would be happy if every teacher was Advanced in only one area – Student Connections. Way to go Kim and Teri! Thanks for making connecting with students a priority on our campus. Should every evaluation include a focus on making connections with students? You know what I think. I would love to hear your opinion. If you Twitter, Tweet This.